Monday September 6th 1897 Will helped me some with the washing and we gave the summer kitchen a going over. I ironed in the afternoon and fixed a place to put down eggs. It was very warm and a hard days work. Tuesday September 7th 1897 I did some mending and work about the house in the forenoon. spent part of the afternoon with Emma. I picked beans before supper. Did the evening work. weather very warm indeed. 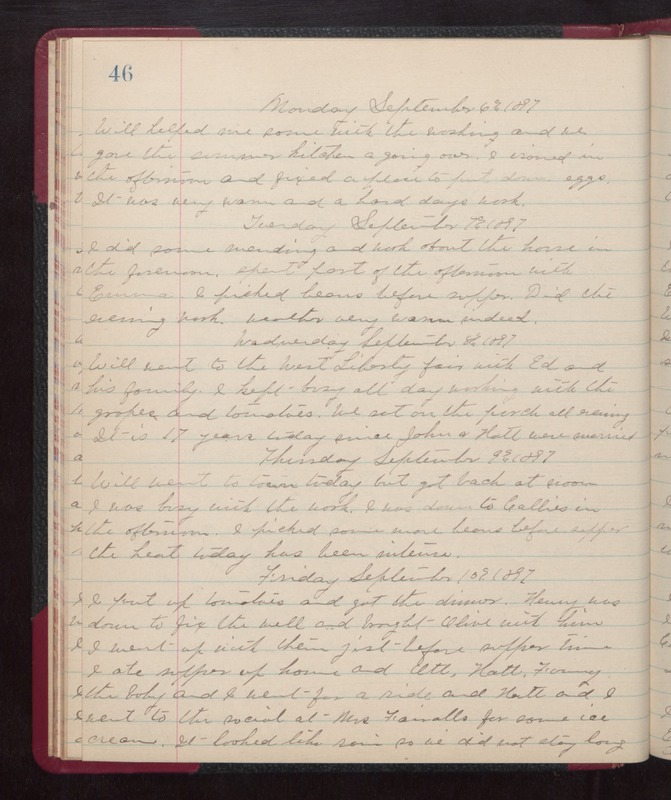 Wednesday September 8th 1897 Will went to the West Liberty fair with Ed and his family. I kept busy all day working with the grapes and tomatoes. We sat on the porch all evening. It is 17 years today since John & Hatt were married. Thursday September 9th 1897 Will went to town today but got back at noon. I was busy with the work. I was down to Callies in the afternoon. I picked some more beans before supper. the heat today has been intense. Friday September 10th 1897 I put up tomatoes and got the dinner. Henry was down to fix the well and brought Olive with him. I went up with then jist before supper time. I ate supper up home and Ott, Hatt, Fanny, the baby and I went for a ride and Hatt and I went to the social at Mrs Fairalls for some ice cream. It looked like rain so we did not stay long.